See notes below for additional information about cleaning methods for these covers. The generic cleaning instructions noted below are intended for use with all Covercraft covers but you should refer to the instruction sheet enclosed with the car cover for any fabric specific care instructions. Car cover fabric performance can be severely affected by dirt that builds up on and within the material. It can cause the windshield and paint to become dirty and “fogged” as well as create “wicking” where it actually helps pull water through the fabric, nullifying any water resistant properties the fabric may have had. Cleaning your cover will help to keep your vehicle clean and to increase the service life of the cover. 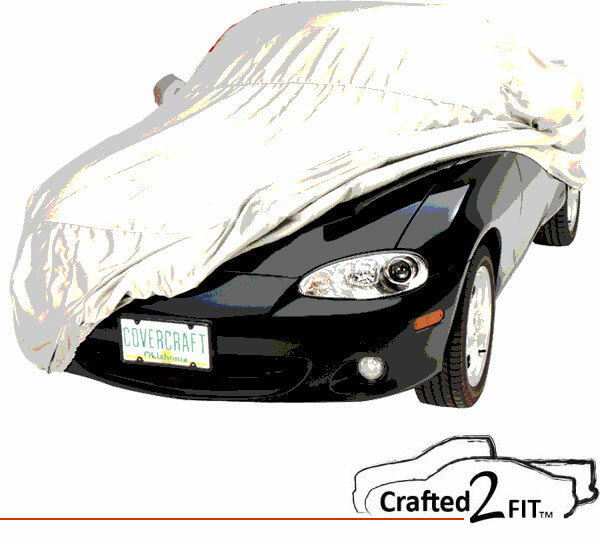 NEVER...Clean a car cover in a washer with a center agitator (except WeatherShield® fabric covers). Using a large commercial washer without agitator, wash the cover using 1/4 cup of Simple Green® All-Purpose Cleaner (some WeatherShield covers are compact enough to be washed in a normal size washer). Put the cover in the washer and pour the cleaner in the tub after it’s filled with warm water or pour it directly in the machine (some wall mounted commercial units), then put in the cover and start the machine. Air dry (unless it’s one of the covers noted above that can be dried in a dryer with regular or low heat). A cover may also be cleaned by turning it inside-out on the vehicle. Mix one ounce Simple Green All-Purpose Cleaner per quart of warm water. Spray or sponge onto cover. Rinse with plain water (until no suds) and allow to air dry.